CHARLOTTE -- The gun that Keith Scott had on him during the deadly shooting was reported stolen after a breaking and entering, police said. Video of Scott being shot by officers was released on Saturday. Police also released images of a gun, holster, and marijuana they say were recovered from the scene. Lawyers for a coalition of media groups have written a letter asking for more video footage and other information related to a fatal police shooting. 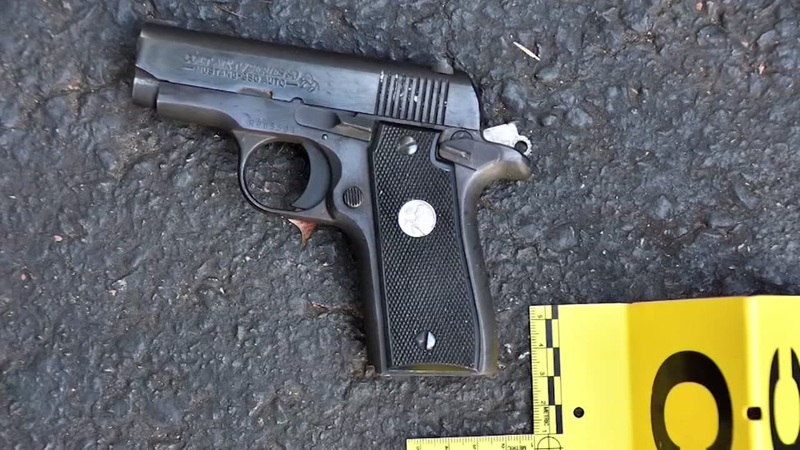 This combination of photos provided by Charlotte-Mecklenburg Police Department shows an ankle holster and gun which police say were in Keith Scott's possession when he was shot. The letter was sent Monday to Charlotte-Mecklenburg Police Chief Kerr Putney and Charlotte City Manager Ron Kimble. It asks for footage of the shooting of Keith Lamont Scott last week that wasn't included in a weekend release of about three minutes of body and dashboard camera video. It also asks for the police incident report. On Monday night, an emotionally charged audience called on Charlotte's mayor and police chief to resign during a forum to let people express opinions about the shooting death last week of a black man by a police officer. More than 100 people jammed City Council chambers to vent their frustrations with police after the shooting death of Scott. Speakers took direct aim at Mayor Jennifer Roberts as well as Charlotte Mecklenburg Police Chief Kerr Putney, calling on them to resign from their respective offices. Roberts and Putney have taken criticism for their handling of the aftermath of the shooting, including the delay in the release of video showing the shooting. After more than two hours of hearing from the emotionally charged audience, City Council members took the floor. Earlier, several hundred demonstrators marched peacefully through downtown Charlotte after leaving a rally organized by the NAACP. The demonstrators left a downtown church Monday evening in a slow-moving procession behind a police SUV down the center of the streets. It's not clear whether the group had a parade permit. Charlotte officials had warned earlier Monday that marching or demonstrating in the streets without a permit is illegal. The Charlotte-Mecklenburg Police Department said Monday that four of the 11 people arrested overnight were charged with standing in the street. Police on Sunday stopped blocking downtown traffic to allow marchers in the road and directed demonstrators to stay on sidewalks. Speakers began lining up in the lobby of the Charlotte Mecklenburg Government Center about an hour before the citizens forum. Many of the people who signed up to speak were carrying signs. One man carried a sign calling for the repeal of legislation taking effect on Saturday blocking the release of police video without a court order. 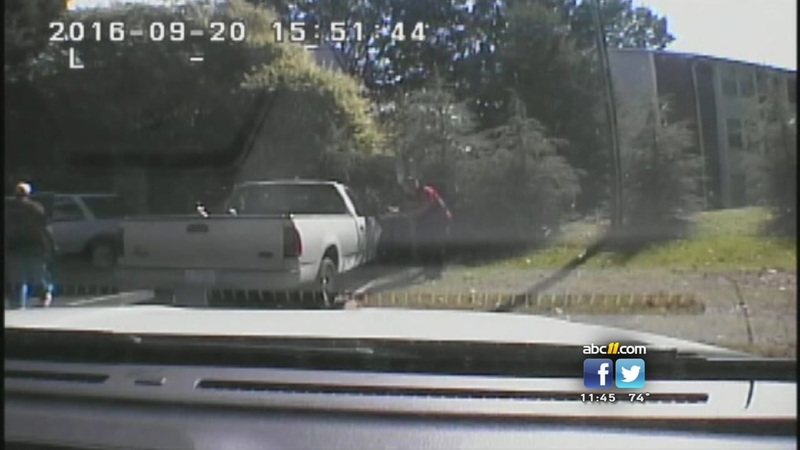 Charlotte-Mecklenburg police released two videos of the fatal officer-involved shooting of Keith Lamont Scott, one from a dash cam and one from a body cam. They also released a new statement on what led up to the incident. I. Full Truth & Transparency. We call for the immediate release and disclosure of any remaining video footage in the custody of the Charlotte-Mecklenburg Police Department or State Bureau of Investigation related to the killing of Keith Scott. We call upon the U.S. Department of Justice to conduct an independent investigation of the killing of Keith Scott. After such investigation, if any officer is found to have engaged in misconduct, that officer must be swiftly prosecuted. We call on the Governor, Attorney General, Mayor and all Local Officials to support a call to the U.S. Department of Justice to open and conduct an in-depth investigation into the patterns and practices of the CMPD and make those findings open to the public. II. Enact Justice & Ensure Accountability. We call for accountability for those officers who were wearing body cameras at the scene when Keith Scott was killed, but who chose to have their cameras turned off. We call on the Governor and elected officials to enact heightened consequences for any police officers who fail to follow the protocols for their body and dashboard cameras, and make failure to do so a fireable offense. We call for a federal standard regarding police use of lethal force, that includes additional training for police officers, guidelines for identifying and removing officers with a propensity to overreact, and a commitment from the U.S. Department of Justice, in collaboration with local prosecutors and the State Bureaus of Investigation, to aggressively pursue investigations, indictments, and prosecutions against law enforcement officers who harm or kill innocent civilians. We call for the retrial of Randall Kerrick, the officer responsible for killing Jonathan Ferrell, another unarmed Black man shot in Charlotte just three years ago. We call upon the Governor, all elected officials, and the NC Conference of District Attorneys to support the immediate repeal of House Bill 972, which will, as of October 1, require a court order to release footage from police recordings, thus further enshrouding in secrecy a system already distrusted by the public that those officials claim to serve. We call for a moratorium on the racially applied Death Penalty and the restoration of the Racial Justice Act in the State of North Carolina, and the aggressive pursuit of the end to wrongful convictions impacting African Americans disproportionately in this state. Prohibit law enforcement officers from racially profiling, provide officers with racial bias training, and hold law enforcement agencies accountable by mandating better data collection of stop-and-frisks and other police encounters, and of any officer-involved killings. Give citizen review boards meaningful authority. Local citizen review boards, not just in Charlotte but in every community, need to have the power to: receive complaints from the general public, conduct independent investigations, and discipline law enforcement officers for their misconduct. Prosecution and punishment must be assured whenever the officer is found to have used the power of the badge, the state and a gun in contravention of the public good. We call for the continued de-escalation and de-militarization of police practices used on protestors exercising First Amendment rights. We call upon the media and elected officials to continue to broaden the conversation to address all forms of violence and correct the public information available about Charlotte today. We call on the media to tell the story of protestors gathering in Charlotte in grief and in righteous, justice-seeking, legitimate discontent raising a unified and righteous call that Black Lives Matter, instead of narrowly focusing on the story of a few provocateurs. We call on Representative Robert Pittenger to do more than apologize for his statement that protesters in Charlotte "hate white people, because white people are successful and they're not." We call on Rep. Pittenger and all public officials, to make a public statement on their stance on the real criminal justice 'state of emergency' and on: reversing the attacks on voting rights in this state; ending the denial of Medicaid expansion and lack of access to basic healthcare; enacting a living wage of $15 and repealing regressive taxes that hurt the working poor; reinstating income tax credits and long-term unemployment benefits; repealing the Jim Crow 95-98 law which undermines the rights of workers to collectively bargain; reversing cuts made to public education; raising teacher salaries and rejecting school vouchers; realizing just immigration reform; rejecting attacks on women's health and environmental protections; and respecting the constitutional rights and humanity of all people regardless of race, creed, class, gender, or sexuality. Finally, we call for the issue of criminal justice reform and the end to racialized policing and police brutality to be made a centerpiece of the Gubernatorial, Senate, and Presidential Debates-starting this evening in the first Presidential debate. Every elected official or person running for office must make it known plainly whether the lives of people of color and the poor in this country matter, not just rhetorically but through their policies, budgets, and legislative and executive actions. We stand united with those across the country calling for this change and can accept nothing less in this time of moral crisis.